The season is reaching full swing and this week brought great guests, great weather and more great encounters. 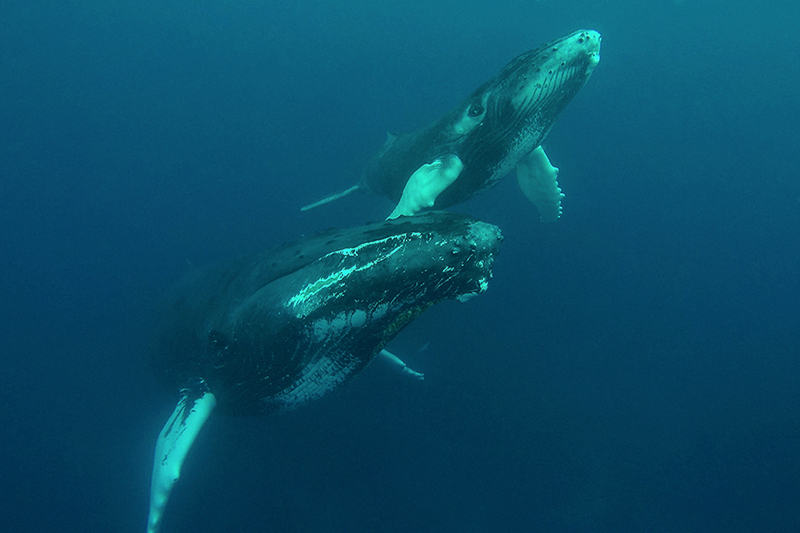 It always fascinates me when a mother humpback whale will alter her course and seemingly turn towards the tender to share her calf with us, and this week it happened again. The mother was so incredibly calm, spending a lot of time on the surface taking nice slow breaths before going down. Her calmness seemed to rub off on her calf as he was extremely relaxed and curious. 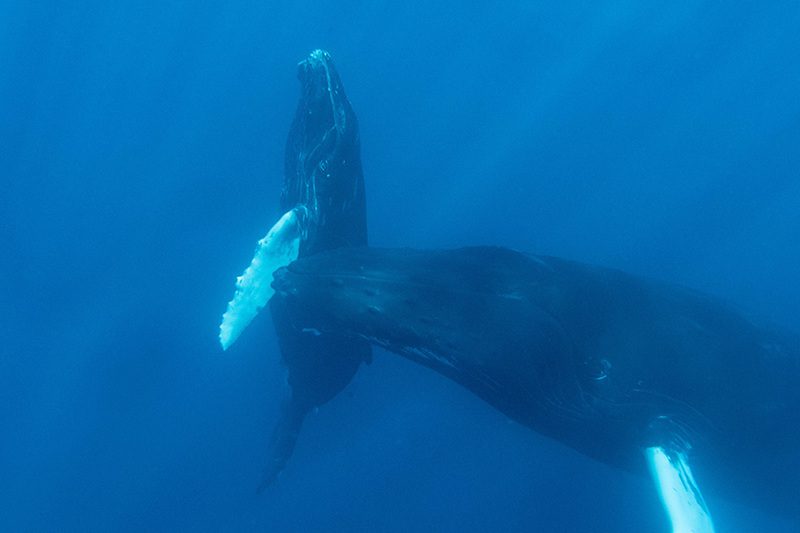 When we slipped into the water to share this soft in-water encounter with the two whales, the calf changed his behavior slightly, spending less time underwater with mom and more time on the surface with us. He would swim close to the group, slowly twisting and turning, showing off his belly and ventral pleats and giving the impression that he was enjoying ‘playing’ on the surface with us. When it was time for mom to come up to breathe, she would give us a nice close passing as well, also turning to show off her underside. 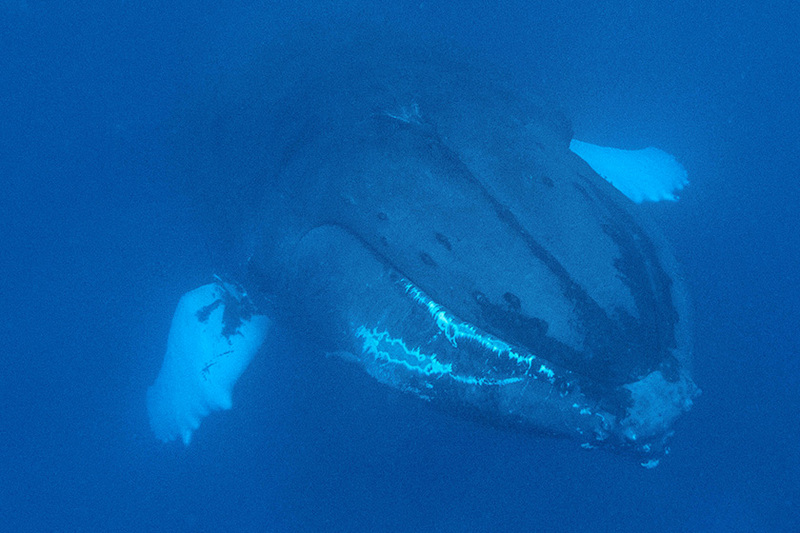 She would only move a body length or two, so we were able to stay in the water with her for many breath cycles, increasing the length of the encounter and giving everyone an extended experience. Towards the end of the encounter we were in the water enjoying the interaction when we were suddenly treated to an odd yet awesome event. The mother was slowly coming to the surface, her calf just above her head, when two separate adult whales came into the picture and swam underneath us as well! For a brief moment we had four whales below us, all calm, moving in separate directions but still together. It truly was a special encounter that can only happen when you least expect it. This week we were lucky to witness a new behavior not seen on the Silver Bank before. On this particular day, the seas were calm and patches of sargassum covered the bank. Sargassum is a floating brown algae that accumulates in patches on the water’s surface simply by drifting into one another and getting tangled up. The size of the patches vary widely, sometimes they can stretch great distances and sometimes there are many small patches floating close together. Sargassum provides a safe haven for many organisms, sheltering many juvenile species as they develop. Looking closely in them, they are always full of shrimps, crabs, fishes, turtles and many other species. Two whales were spotted lying on the surface near a patch of sargassum and as we approached, we saw they were actually using the sargassum. 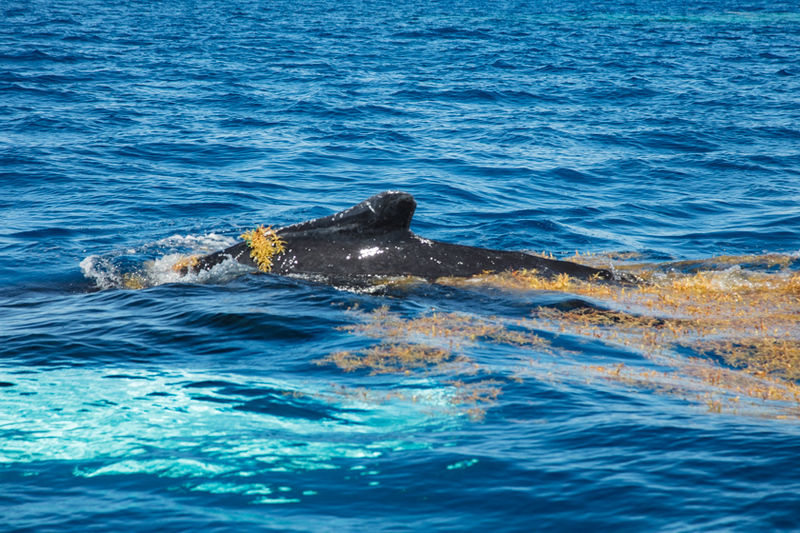 The whales swam on the surface through the sargassum, letting it run along their backs. We didn’t think much of it, until we started to notice they were always moving towards other floating patches and each time as they neared a patch they would surface and run their body through it. 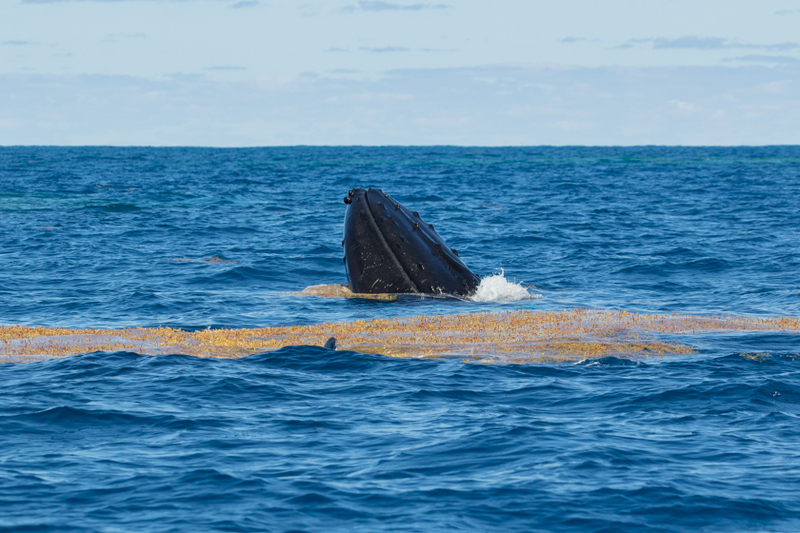 Many times, when the whales approached a new patch, the presumed female would come up directly below the sargassum and spy hop out of the water. 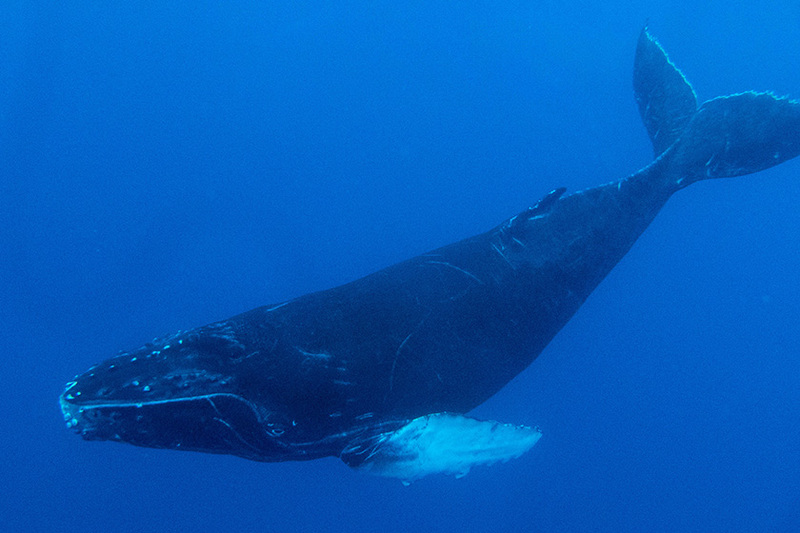 The sargassum would get caught on the whale’s tubercles and hang off the whale as she spy hopped. 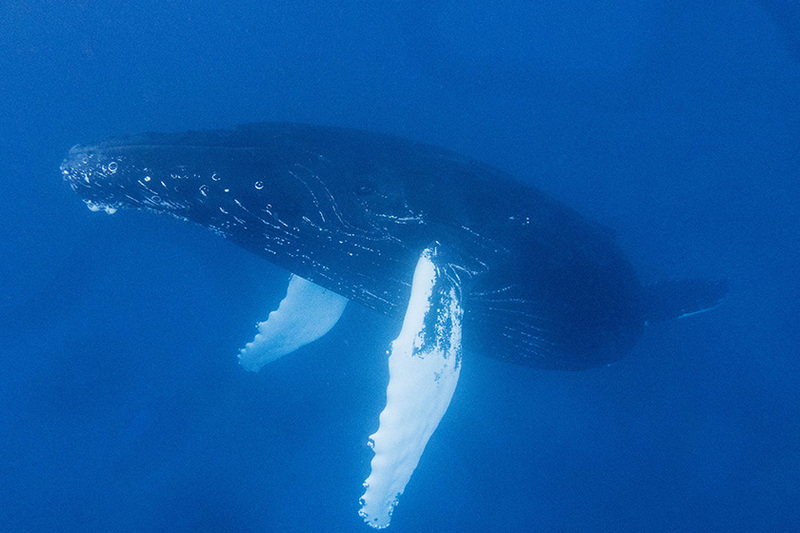 Occasionally, the whale would turn slightly on her side and skim the surface, making the sargassum brush against the side of her face as they swam through the patch. The whales seemed to really enjoy brushing up against the sargassum and kept directing their course so they would hit another patch. Week 5 at the Silver Bank was the first week of really good weather and flat seas. There was almost no wind, a great full moon and a green flash to complete the week. This season brings an all new experience for me, driving the tender instead of being in the water, with the responsibility to bring my passengers a good encounter. 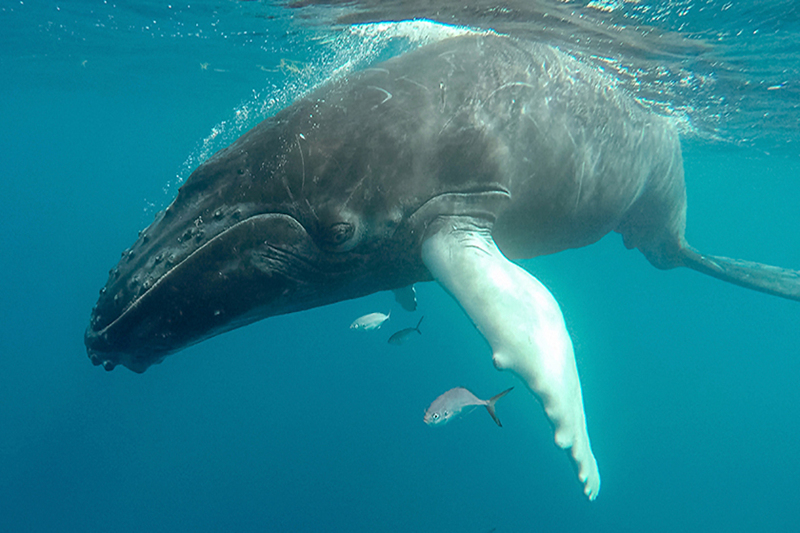 The week started with a soft-in-water encounter with a pair of whales for one and a half hours. As the week progressed we continued to have other encounters with mothers and calves, sleepers and rowdy groups. One encounter in particular was very special. After working a mother and her calf, I found a single whale that was staying down for 12 minutes. I put Joe in the water and discovered that it was a “singing whale”. What a great and unique experience our guests were able to experience being in the water with a singing whale! We could hear it through the hull of the boat and were able to be in the water three times before he stopped singing. Just a small number of people have been able to be in the water with a singing whale and this week we were able to offer that unique experience to our guests. Just before noon on Tuesday we came across a mom and calf. The calf was practicing its surface behaviors by breaching and lob tailing for quite some time while mom followed along to stay close by her busy calf. 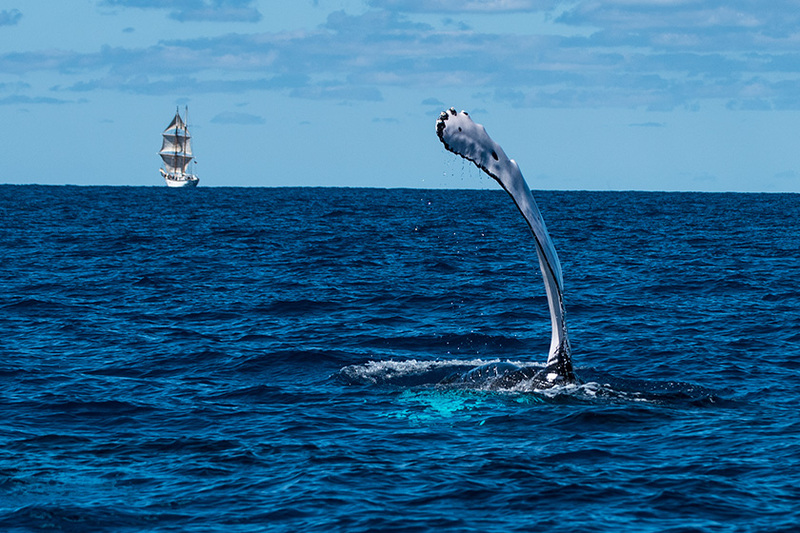 We stayed alongside, giving the guests a great opportunity to get some above water photographs as well as to see why the humpbacks are called acrobats of the sea. Once the calf had seemed to tucker itself out, mom slowed as if she wanted to rest. We began to “work” her, allowing her to get comfortable with the tender in hopes that she would settle, which would allow us to get into the water with her and her calf. Mom seemed a bit timid, not going very deep while resting close to the surface. She kept her calf close to her as it went through its breathing cycle. In turn, we gave her plenty of space and when the calf came to the surface for its breathing cycle it started breaching again. After some time, once again the mother seemed to settle and the calf started doing the “little circle thing”. I decided to send the scout into the water with hopes that we had gained mom’s trust. 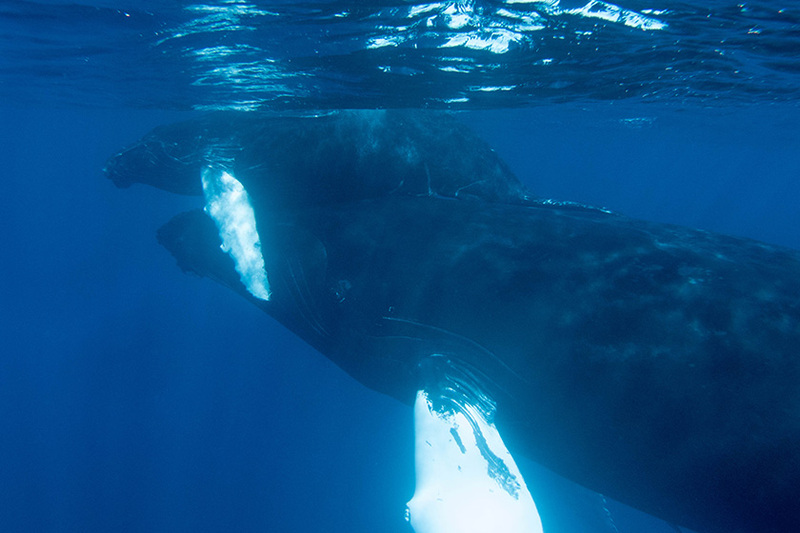 The calf stayed under mom’s pec fins for its resting cycle and when it came to the surface to breathe it was still circling tightly above mom’s head before going back down to rest again. The next time it came up again, the calf came close to the group, checking out what those things were floating at the surface. The calf moved farther away from mom than she was comfortable with and she slowly moved off. The guests got a great up close encounter with the curious calf but at that point we decided to let them go as to show mom we only work on her terms, with hope in the future that she will allow us more time with the two of them knowing that we come with peace and respect for them.